Optimus Prime is the largest, strongest and wisest of all Autobots. Feels his role is the protection of all life, including Earth-life. Fights unceasingly to defeat the Decepticons. Splits into three autonomous modules: 1) Optimus Prime... the brain center known as the Commander; 2) Roller, the Autobot scout car... a spy who operates up to 1200 miles away; and 3) Autobot Headquarters... the combat deck equipped with a versatile mechanic/artillery robot. Injury to one module is felt by the other two. The vehicle mode pretty much looks like it's supposed to (a late 70's, early 80's era Mack-style truck) and has a decent amount of detailing in this mode. The wheels seem to be of high-quality rubber or rubberlike material and it's a solid mode. 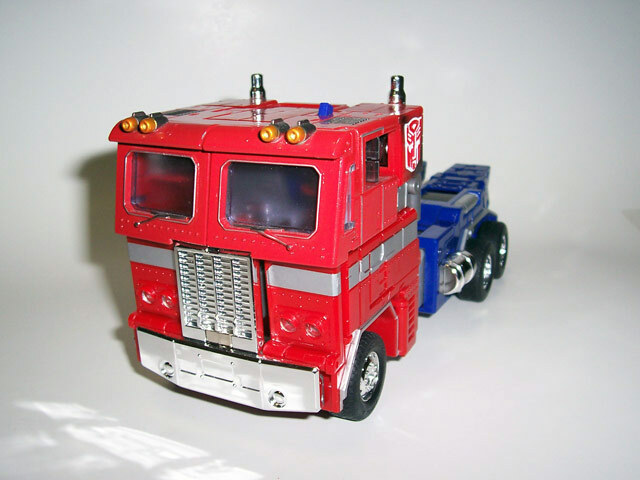 The figure only comes with the cab portion of Optimus Prime for cost reasons (you'd likely have to pay well over $100 if they'd included a trailer), but there have been some kitbashes popping up frequently on ebay and elsewhere. I don't begrudge Hasbro for not releasing it with a trailer (the Takara Japanese version didn't either), but some people seem to take issue with this. The cab's perfectly fine and the only reason I'd like the trailer part would be to store all the accessories he comes with. 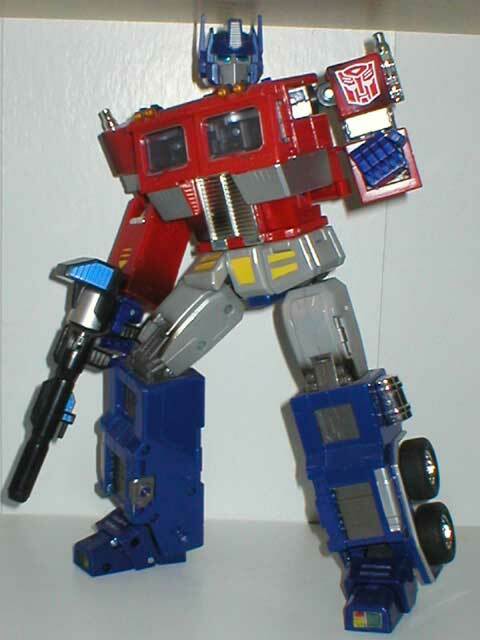 This really is the best Optimus Prime ever. Individually articulated fingers, realistic articulation everywhere, awesome accessories, cool built-in features, and an aesthetically pleasing appearance. 20th Anniversary Prime's got it all. Something I think the American version has over the Japanese release is that his fusion rifle matches the color seen in the cartoon and comic instead of light gray. He comes with an energon axe like the one seen in first cartoon miniseries and a little Megatron in gun mode as seen in another episode of the cartoon. The energon axe can take some work fitting into this arm, but it's ultimately a really cool accessory. However, Megatron in gun mode doesn't seem to fit very well into Prime's hands and the extended stock will always have to be folded down. Still neat though and the designers paid enough attention to detail that you can remove the silencer, scope and extended stock, just like with the orginal Megatron. I should also say that the fusion rifle sadly doesn't fit as snugly into Prime's hand as it should and this has irritated me to no end when putting the figure on display. The two big changes that many have moaned about between the Japanese and American versions are the shortened smokestacks and battle damage. The smokestacks were shortened for the US release due to safety regulations but they don't seem so short to me and even seem just as long as Prime's stacks usually were in the cartoon and since this figure is very clearly based largely on the cartoon, I fail to see what the big problem is. Of course, I, unlike some people, understand that this is ultimately a toy and that Hasbro's a toy company and they must follow toy saftey regulations. The battle damage confuses me a bit as I don't really see what the need for it was, but I kind of like it. I feel it gives the figure some character and is certainly more realistic than an Autobot Commander who's been through millions of years of civil war without a scratch. Transformation: 9 - Very well-designed to go from a good vehicle mode to an astonishing robot mode. Only reason it loses a point is because transforming the legs always requires a bit of muscle and honestly frightens me sometimes as I feel I'm about to break a $63 toy. Durability: 10 - Very solid figure. Fun: 10 - Lots of great accessories, great articulation. Fun for play or for posing and display. Price: 7 - I ultimately feel it was worth the price, but if you're on a budget, it might be worth holding off and seeing if they ever go on sale. There's plenty in distribution now so I don't think there are concerns about anyone running out. 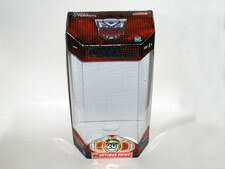 However, it would have been nice for a smaller or entirely plastic version to be officially released in the Alternators line to give more frugal Transfans a pricebreak. Summary: 10 - Best. Prime. Ever.